Over the last half-dozen years, Virginia’s capital city has become a hotbed of brewing and beer appreciation. Richmond’s demographics, a moderate cost of living and a pro-business, pro-brewery governor, Terry McAuliffe, have all helped shape the current scene. The city is located in the central part of the commonwealth, two hours south of Washington, D.C., and the same distance from Virginia’s coast. There is also an energy to the beer scene, as residents are truly excited about Richmond’s transformation into a desirable, beer-centric place. Start in Carytown, a district filled with shops, bars, restaurants and residences, and visit The Cask Cafe (206 S. Robinson St.), a bar run by dedicated beer lovers who always offer several interesting choices among their 16 taps, from local to international. The Cask also has a solid selection of artisanal cheeses and meats, a well-thought-out bottle selection and a full bar. In warm weather, its garage-door-style windows can be opened up to provide an indoor-outdoor, relaxed atmosphere. Next, visit Strangeways Brewing (2277A Dabney Road) in midtown Richmond. Strangeways opened in 2013. It brews a wide variety of beers. Seek out tart, sour brews, such as gose and Berliner-style weisse, especially barrel-aged versions. Try the Legalize It Mystic Man IPA, brewed with fresh, dank hops. Strangeways is appropriately named. The tasting room walls are painted blue, and there are images of monkeys drinking beer, and a stuffed wild boar head is mounted behind the bar. Your next stop is a Richmond institution, the beating heart of the local beer scene. Mekong Restaurant and Bar (6004 West Broad St.) opened in 1995. Don’t let its small exterior facade fool you: inside is a large, multi-roomed establishment, its walls covered with breweriana, where locals and visitors alike converge. 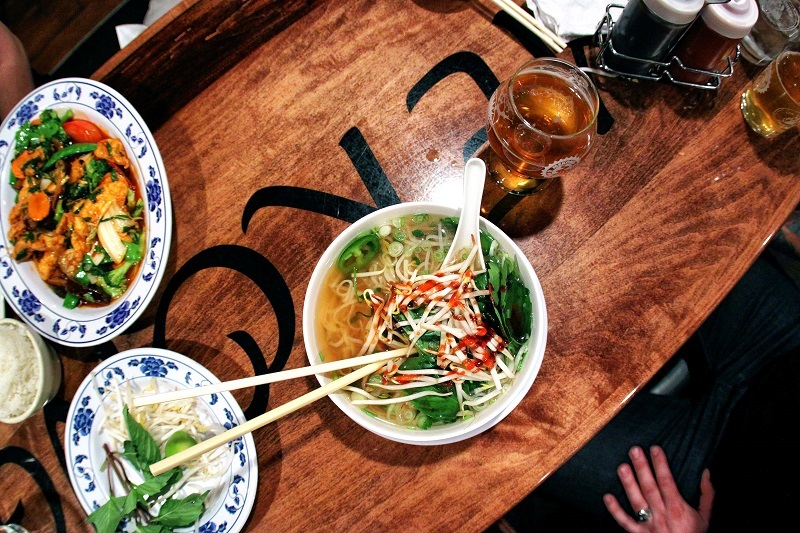 Owner An Bui found success in pairing a large variety of authentic Vietnamese dishes with a great selection of beer. There are 50 brews on tap and more in bottles. Bui’s infectious enthusiasm is part of the formula as well. The aromas of Vietnamese food wafting in the air will surely make you hungry, so order the Tom Hoa Tien (Rocket Shrimp) appetizer and then Pho Dac Biet, rare sliced beef and meatballs in a soup broth, with flat noodles and veggies. And always remember An’s motto: Beer is the Answer. Steps away is The Answer Brewpub (6008 W. Broad St.) also owned by Bui. This large venue is a brewery, beer bar and restaurant, which also offers Vietnamese-themed food. Do not miss the Wake N’ Bacon, and pair it with brewed-on-site Larceny IPA. There are 50 beers on tap, which usually include about half a dozen house beers. The Answer excels at hop-forward brews, such as Grand Larceny Double IPA and Mouth Hug Imperial IPA, as well porters, stouts, Berliner-style weisse beers and more. Begin your Saturday with brunch at 821 Cafe in Carytown (825 West Cary St.). 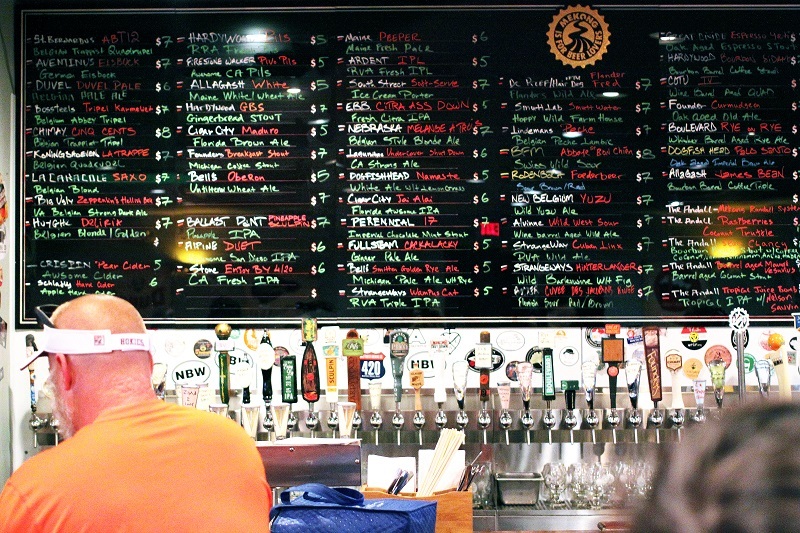 The 16 taps at this hip locale rotate often, as 821 likes to keep you coming back. Feast on a savory signature omelet stuffed with bacon, ham, sausage and cheese. Or go with a vegan breakfast burrito, with tofu, rosemary potatoes, black beans and vegan sausage. You’re going to need a solid base today. Next, head to Scott’s Addition, an old warehouse district, now also residential, which is currently being transformed into an artisanal alcohol production area. There are already three breweries in the neighborhood, as well as a meadery, a distillery and a cidery. It’s Richmond’s hottest neighborhood for those seeking artisanal adult beverages. Sometime in 2016, look for Väsen Brewing Co. and Three Notch’d Brewing to open here. Until then, check out Ardent Craft Ales (3200 W. Leigh St.) which has become a much-loved destination since it opened in 2014. The open-air patio can seat 150 people and is often packed. Inside is a cozy tasting room with dozens of tables and a long bar, and the stainless steel brew house is in the back of the building. 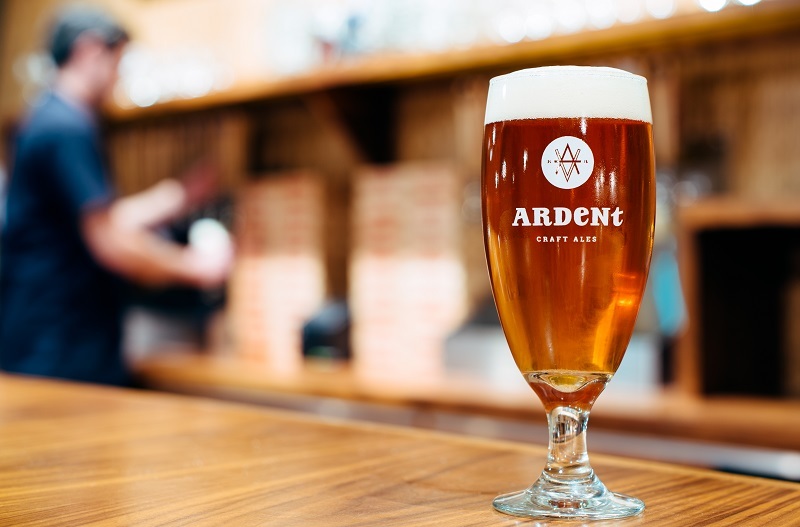 Ardent’s rotational IPA series showcases many different hops, and these brews exhibit intense flavors and aromas: floral and bitter, sometimes fruity and tropical, and well balanced. Beers such as Sweet Potato and Sage (a saison) show a willingness to experiment and to do it well. There is much barrel aging in progress. Look for food trucks on site, such as the excellent ZZQ Barbecue, which will open a permanent location in Scott’s Addition in 2017. Next, walk three blocks to the highly anticipated The Veil Brewing Co. (1301 Roseneath Road) which opened in April. The Veil brews spontaneously fermented beers, IPAs/double IPAs, imperial stouts, Brettanomyces-fermented ales and hoppy wheat beers. There is a coolship on the brewery’s roof and a large barrel-aging facility nearby. Brewer and co-founder Matt Tarpey honed his skills at The Alchemist and Hill Farmstead in Vermont. 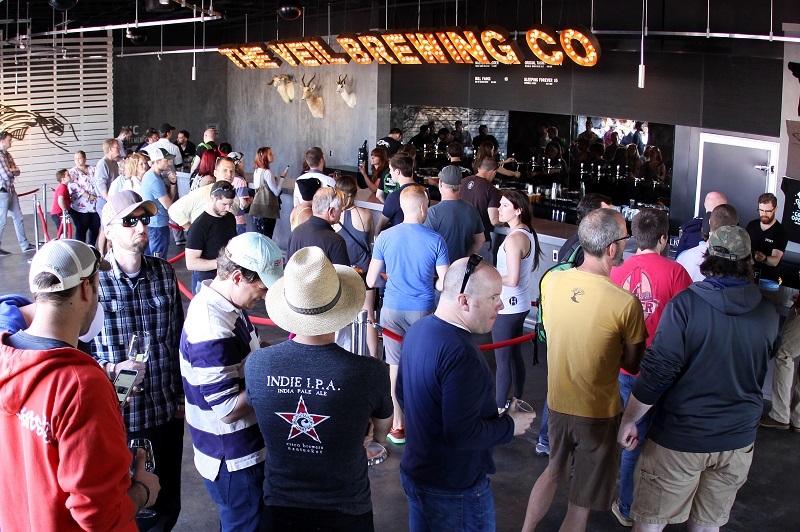 The Veil’s industrial/modern tasting room has garage doors that open to the parking lot outside, with patio seating. If the beers are as good as expected, The Veil could become a destination brewery for beer lovers near and far. Hardywood Park Craft Brewery (2408 Ownby Lane) is a five-minute drive east of The Veil. Hardywood is perhaps best known for its large range of stouts, such as the superb apple brandy barrel-aged Trickery, a big brew with notes of dark chocolate, fruits and a mild sweetness. Truthfully, Hardywood brews a big range of beers, from Belgian to German to U.S.-inspired. Hundreds of oak barrels on site contain multitudes of brews, quietly maturing. On busy special beer-release Saturdays, thousands of people, a dozen food trucks and live music can be on site. Next up, head to the Jackson Ward neighborhood, a short drive southeast. Have a relaxing dinner at Saison (23 W. Marshall St.) a friendly, cozy gastropub with an award-winning beer program. Try the Foie Gras Paté, the Belly and Egg, or the Rohan Duck Breast, and pair it with a Stillwater Cellar Door Saison, a house favorite. Or pick another brew from the 12 taps or the bottle menu. Finish your night at Commercial Taphouse (111 N. Robinson St.) a mile away. Commercial is Richmond’s original craft beer bar, and its 20 taps feature a variety of beers, from local to international. Make a brunch reservation at Station 2 (2016 E. Main St.), a bar/restaurant in Shockoe Bottom, east of downtown. The locale is a former fire station, now quenching thirst and hunger with a dozen beers on tap and serving delectable meals. Try the country fried pork and waffle, a pork loin served with a Belgian waffle and sausage gravy. Two blocks east is the Edgar Allan Poe Museum (1914 E. Main St.). You can continue east and visit Chimborazo Park (2900 E. Grace St.) site of a hospital for Confederate soldiers during the Civil War, with a great view of the city. 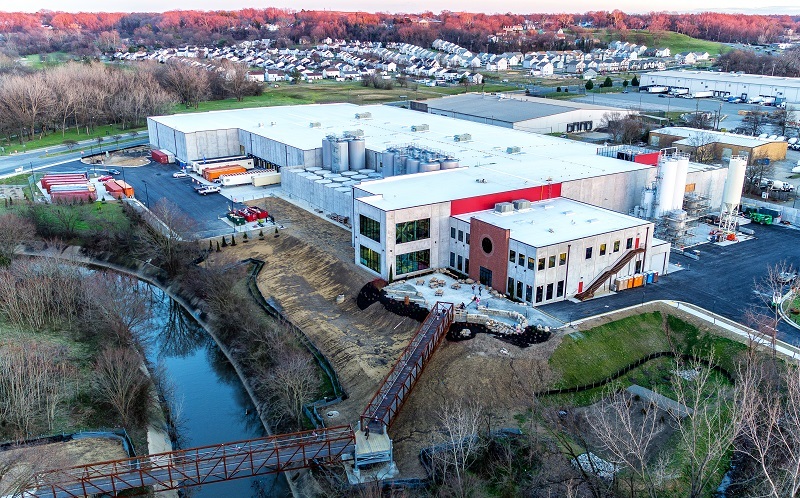 At this point, you’re less than a mile from the new Stone Brewing Richmond (4401 Williamsburg Ave.) Beer drinkers were already filling Stone’s new brewery tasting room and patio two months before the brewery was set to crank out its first batch. (Stone’s San Diego location provided the initial beers.) The tasting room has 28 taps and a growler filling station. In about two years, Stone Brewing World Bistro & Gardens will open on the James River, less than half a mile away. Scoring the massive $74 million Stone project was a huge win for Richmond. 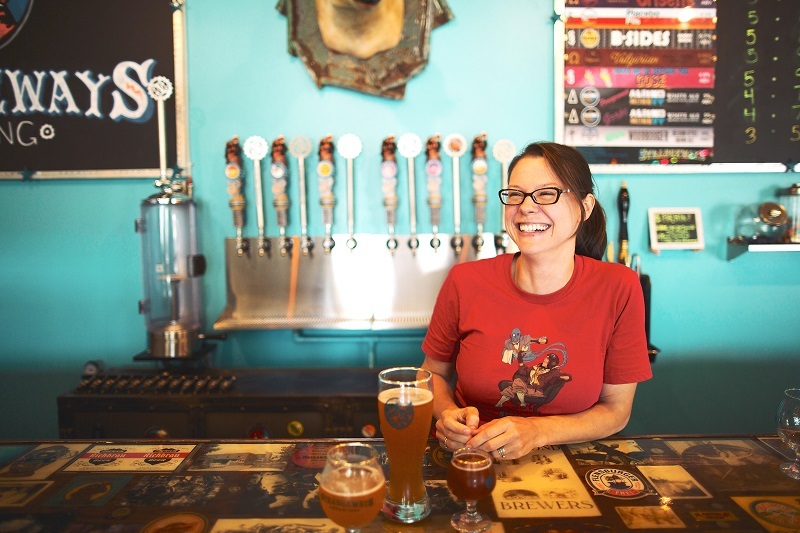 Between downtown Richmond and Carytown, Triple Crossing Brewing (113 S. Foushee St.) offers great hoppy beers such as Falcon Smash IPA and well-made saisons (some with Brettanomyces) and stouts. Its tasting room and patio are popular spots. Used to live in Richmond (2004-2007) loved every minute of it. Seems like I gotta get back in town to experience all the great additions. Great article. Any chance of coming further east to the Norfolk/Virginia Beach region? It got it’s own beer scene, with more sun filled and dog friendly-er establishments. I get that 48 hours limits you, but I would have skipped over Mekong (highly overrated) and included Isley, which is just a few blocks away from Ardent in Scott’s Addition. Also next time you’re in town don’t miss Lickinghole Creek (Goochland), which has some of the best beers anywhere. You forgot to mention that you can get a crowler to go at The Answer.